The Millrose Games was not the only action from this past weekend. Let’s finish recapping the weekend before we start diving into HepsWeek items. The Cornell men and women took advantage of one last home meet opportunity before next week’s Indoor Heps Championships and established several conference-leading marks at the 2016 Marc Deneault Invitational on Saturday. In the sprints, sophomore Ryan Wiegel ran 6.83 seconds in the 60m finals, a time that is currently the second fastest conference time. Junior Wynndham Curtis was third in the 60m hurdles but ran a time fast enough (8.09) to rank fourth in the conference. Max Hairston was second in the hurdles (7.96) but has run faster this season — his seed of 7.93 is a tenth of a second faster than anyone else in the Heps right now. Senior Larry Gibson won the 200m in a converted time of 21.76 (tenth in the conference). On the women’s side, standout freshman Leena Morris used the opportunity to establish yet another set of personals best in the shot put (44-11 ½) and the weight throw (57-07). Morris’s sophomore teammate Michaela Smith threw 44-07 in the shot to place second. Morris and Smith rank 2-3 in the conference rankings for the shot put going into Indoor Heps. The USATF New England Championships often provides a last meet for athletes to participate in to either fine tune their championship qualifiers or one last hurrah for the season. A few HepsNation athletes competed on Sunday at the Harvard facility. Harvard’s Mitch Valko was the lone Ivy League undergrad to win an event on the day, as he won the hurdles with season’s best time of 8.35. His teammate Ian West came second in the pole vault after jump-off procedures were done to determine the winner as both West and the winner cleared 15-05. David Gawlas placed in the top 6 in both the 60m dash (5th – 7.09) and 200m (6th, 22.79). Brown’s Chris Garzia placed in the top 3 in two events at the meet: third in the hurdles (8.41) and second in the long jump (season’s best 23-08 ¼). Teammate Paul Touma also improved upon his season’s best in the triple jump as his 45-05 distance was good for third in the competition. The Brown women also fared well. Shandell Scott improved her season’s best in the long jump by 7 inches to 17-09 ¾ to finish second in the event. Aubryn Samaroo tied her personal best in the high jump (5-05) to finish second overall. Charlotte Walmsley was third in the 800m (2:18.52) while Lucia Cooke was the runner up in the 5,000m (18:51.78). Among the HepsNation alumni, newly engaged Rachel Sorna and John Schilkowsky won their respective 3,000m events (Sorna in 9:52.61, Schilkowsky in 8:38.86). Emmaline Berg continued to win in the shot put with a heave of 53-05 ¾. David Melly had to settle with a runner up finish in the mile with 4:14.07. 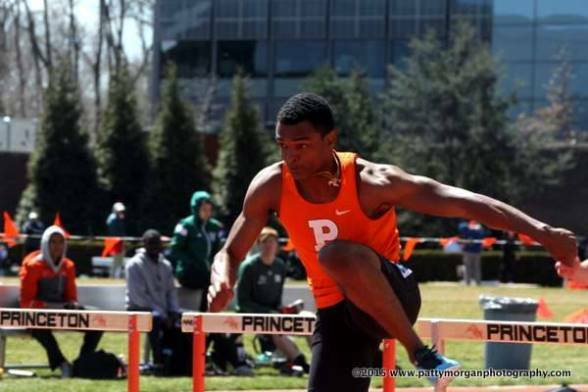 Princeton and Penn got one more chance to compete on a flat track at the Princeton Invitational before heading to Cornell’s Barton Hall this weekend. In many of the events, it was a battle between the two Ivy schools. Many of the resulting performances broke into the top 10 of the conference seasonal rankings. The Tiger men won nine of the contested events of the day. Greg Caldwell led a 1-2-3 sweep in the hurdles, winning in a new season’s best time of 8.03 that ties him second in the conference rankings going into Indoor Heps. Rookie Adam Kelly broke into the record books with his winning throw of 68-06 ½. The personal best for Kelly ranks him #8 in the conference record books while inching him closer to the conference leader this season, Rudy Winkler. Jake Scinto set a new indoor best in the long jump to win the event with a distance of 24-00 ¾ – the third best distance in the conference to date. Rookie Charles Volker ran his second fastest 60m time of the indoor season (6.80) to win the event. Other Tiger event winners included Christian Fryer-Davis (500m – 1:05.42), Stephen Rossettie (800m – 1:54.31), Brett Kelly (3,000m – 8:45.91), Andrew Diehl (high jump – 6-07), and Lane Russell (triple jump – 48-08 ¾). The Quaker men won two events of the day. Kirk Webb led a Quaker 1,2,3,4 finishing sweep in the 1,000m with his 2:28.46 winning time (a new season’s best) while Kirk Convey won the mile in 4:17.80. A number of the Quakers improved their conference standings, especially in the field events. Sam Mattis set new lifetime bests in both the shot put (55-08 ½) and weight throw events (60-09 ½) to finish third in both events. He now sits in the top 5 in both throwing events. Teammate Noah Kennedy-White also improved his weight throw mark to 58-03 ¾, improving into scoring contention for Indoor Heps. Rookie Calvary Rogers was the top collegian in the 200m, winning in 22.17. The Tiger women had two 1,2,3,4 scoring sweeps in Sunday’s competition – the 500m and the 800m runs. Cecilia Barowski won the 800m by 10 seconds, resulting in a new personal best that ranks her #3 in Ivy League history – 2:04.66 (when converted from flat-to-banked, she’s ranked #3 in the NCAA Division 1 with 2:03.24). Jackie Berardo led the charge in the women’s 500m with her 1:15.66 winning time. While Taylor Morgan had the fastest hurdle time in the preliminary round (8.83), it was Ellie Randolph who won in the finals with 8.98. Allison Harris continues to clear heights higher than the conference record setting prior to this season as she won the pole vault in 13-07 ¼.
Rachel Wilson was the top Quaker performer of the meet as she broke the school record for the weight throw again this season. This time, she won the weight throw with a 56-07 ¼ mark, ranking her third in the conference. Candace Taylor had little competition in the 400m, winning by over a second with her time of 57.43. Kylene Cochrane and Marin Warner went 1-2 in the 1,000m, running 2:55.76 and 2:58.08 respectively. Elyssa Gensib was the final Quaker winner of the day with her 5:01.78 time in the mile. This entry was posted on Monday, February 22nd, 2016 at 9:57 am. It is filed under Athletes, Spotlight. You can follow any responses to this entry through the RSS 2.0 feed.